Porchétta [por’ketta] n. roasted pork with crispy skin, highly seasoned with aromatic herbs and spices, garlic, sage, rosemary and wild fennel pollen. Typical plate of the Roman cuisine. Slow cooked Italian fast food. I admire anyone willing to offer nothing but meat and bread. There are plenty of situations where I would decry such a thing, where the meat clearly can’t carry things, but when you have enough faith in what you’ve roasted that you serve it plain, I’ll gladly line up to try it. I feel like I could list a dozen things that would go well with the porchétta, but that isn’t what’s on offer here. What’s on offer is just meat and bread, and that’s no small risk. It works. It’s a delicious sandwich. 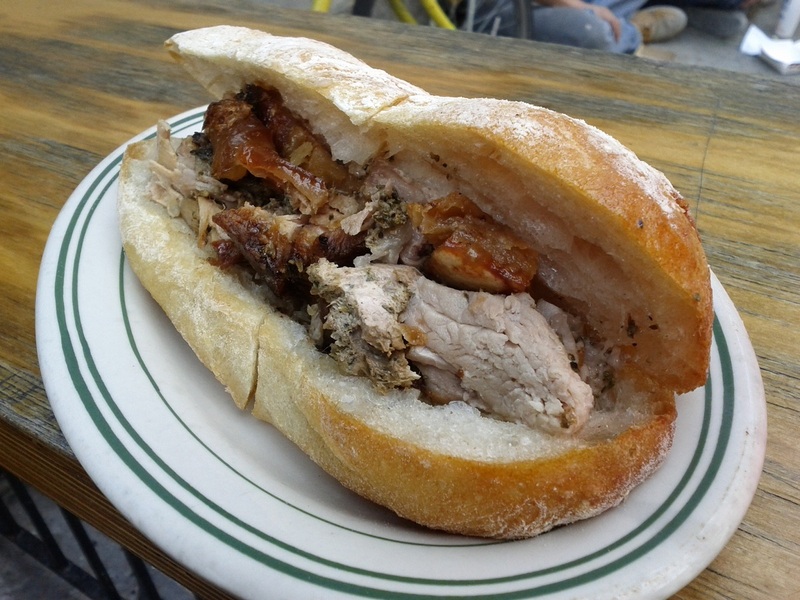 The herbs are front and center, the pork is tender and juicy, the bread is soaking up every bit of juice the meat lets loose, and the crust on the bread is enough that despite a total lack of supporting ingredients, the sandwich feels substantial. It’s not perfect; I felt the skin wasn’t so much crispy as just hard, and there were a few places where I might have thought I was chewing on a small bone. They can be dealt with, though, and everything around them is wonderful. I would say that I’d like to see one ingredient sandwiches more often, but the establishments capable of succeeding with such a sandwich are sparse. Let them instead rest as rare islands, surrounded by a sea smart enough to realize all it has to offer is water. This entry was posted in Sandwich Reviews and tagged New York, Pork, Reviews by Pete, Sandwiches I Have Eaten, Sandwiches Made For Me by Pete. Bookmark the permalink.